David Shukman of the BBC claims that “The weed so familiar to many of my generation was characterised by a relatively balanced amount of THC and CBD” when compared to today’s hybrid strains. Shukman’s claim is true only of traditional hashish from regions such as Afghanistan, Morocco, Lebanon and Nepal. Old-fashioned cannabis resin, which is made from landraces that have been selected for resin production and had little selection for potency, does often exhibit a roughly balanced 1:1 THC:CBD ratio. But even back in the ’60s and ’70s, during an era in which we are told cannabis was a more innocent and far gentler plant, there was plenty of imported cannabis in which CBD was often entirely absent and THC levels could be very high. Typically, this took the form either of refined cannabis oil or—more usually—of high quality ‘ganja’, meaning cured unseeded or lightly seeded flowering tops from the tropics and subtropics. 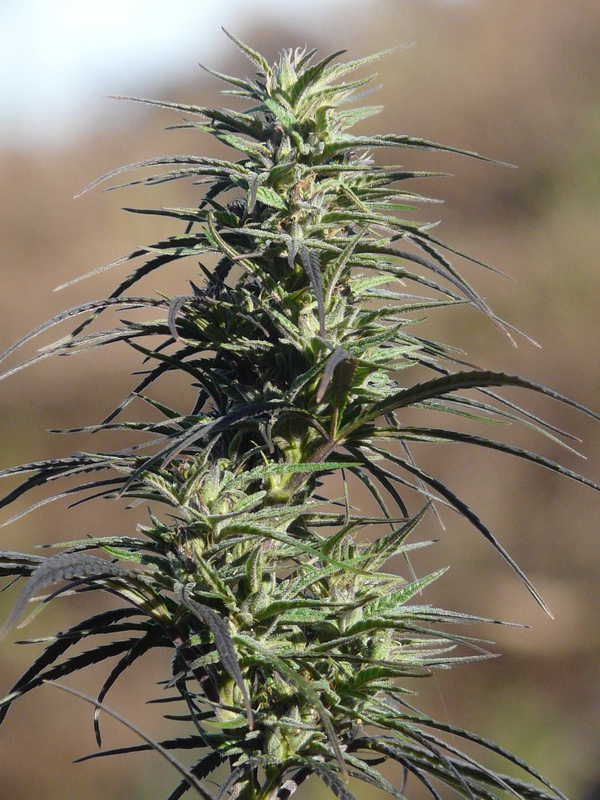 A traditional ganja strain flowering in Manipur, in the Indian tropics. Unlike hashish landraces, the strains of cannabis that have been grown for centuries in the tropics and sub-tropics to produce ganja most often have little or no CBD and can even exhibit levels of THC comparable to those of so-called ‘skunk’. This applies, for example, to Thai, South Indian and traditional Colombian varieties. Their informal brands back in the hippie heyday were the likes of ‘Thai Stick’, ‘Kerala’, and ‘Colombian Gold’. 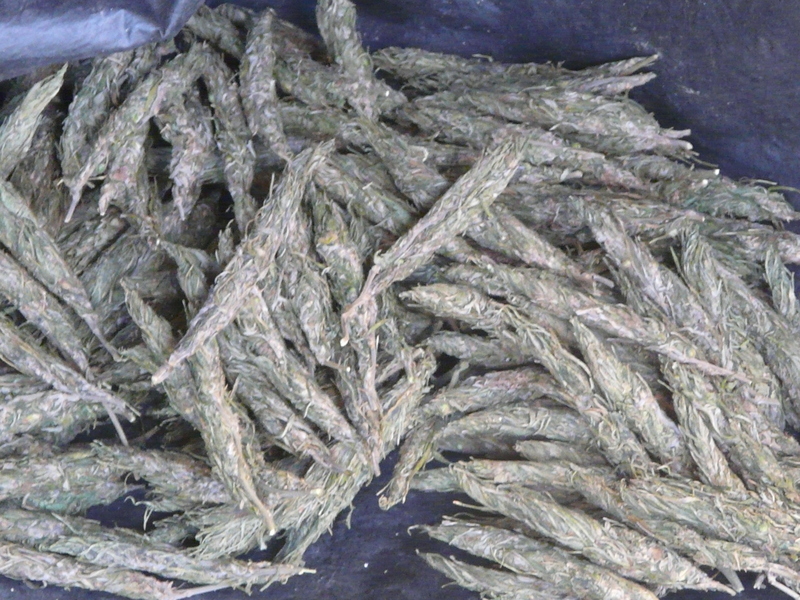 Traditional Indian ganja (‘herbal cannabis’). For skeptical readers there are some figures to back up what many older smokers know to be true from personal experience. In 1975 and 1976 the Laboratory of the Government Chemist reported Thai with as much as 17% THC—and that was after the bud had spent months on boats reaching England. THC levels such as this are far from unusual in Southeast Asia. In the ganja growing heartlands along the Mekong River generations of cultivators have provided a continuous selective pressure for high potency. A key part of the underground cannabis economy in Thailand is formed by breeders who specialise in producing high quality seed, which is then supplied to farmers when they are commissioned by well-connected patrons to raise a field or two. The best of any season’s harvest comes from such fields. Similarly, in the Imphal Valley of Manipur, all farmers and personal growers know to keep seeds from good (i.e., potent) batches of ganja for sowing the following season. 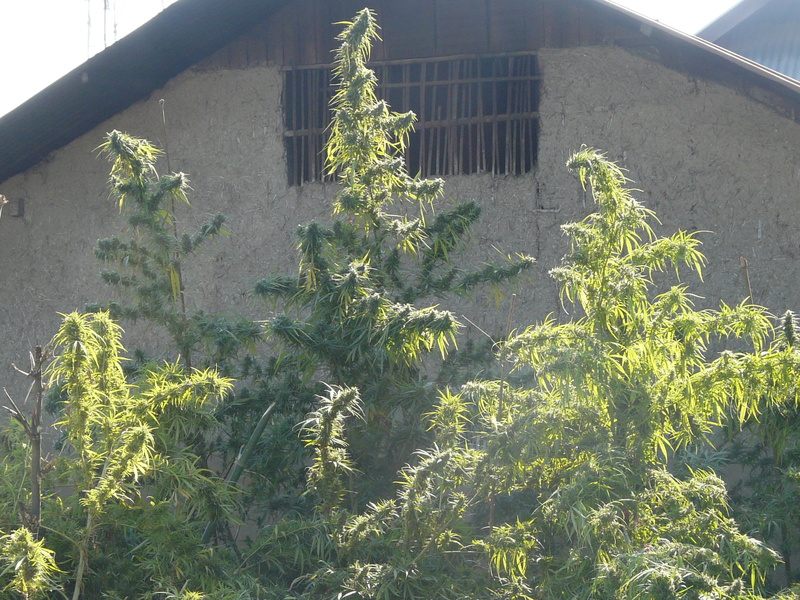 A garden of ganja plants in Manipur, India. The latest data from the Forensic Science Service Ltd (FSS) show that the average tetrahydrocannabinol (THC) content of mature flowering tops from plants, otherwise known as sinsemilla, seized and submitted to the FSS from the 1 January 2008 to the present day was 14.0%. By comparison, during the same period, the average THC content of traditional imported cannabis and cannabis resin was 12.5% and 5.5% respectively. On average, skunk (the FSS called it ‘sinsemilla’) showed only 1.5% more THC than ganja. So much for many times more potent. Only in hashish would this have been offset by a similar quantity of CBD. In fairness, the BBC’s reporting on cannabis does seem to be improving. But—even if unwittingly—Aunty is still feeding the skunk hysteria. Looking again at the LGC data I see that in ’78 a sample of Indian cannabis resin showed 26% THC—this resin is very likely to have been prepared from tropical ganja plants rather than northern, Himalayan charas landraces. Customs bagged a 16% THC batch of Moroccan resin in ’75, and a shipment of Pakistani resin with the same strength in ’78. And then there are the concentrated extracts—‘hash oils’—with Indian, Kenyan and Pakistani samples all hitting around 40% THC. Simple extracts of this potency need to be made from starter material with a high cannabinoid content. The most potent was 48% THC oil from India seized in 1975. That noted, the LGC does make the important point that “Cannabis resins normally had higher THC contents than most herbal material…”. Typically, the ‘herbal cannabis’ reaching UK shores during this era was of fairly low potency—mid to low single figures THC—either because it was from poor stock, or had degraded en route. This does, to be fair, support the kind of line Shukman is taking, though not the current media focus on CBD. Ganja seldom contains CBD in any relevant quantity. Outside Southeast Asia, some of the best bud to reach Britain in the ’70s appears to have been coming from Rhodesia—now Zimbabwe—with a sample hitting 12%. Nigerian and South Indian ganja seizures were milder, at 7.4% and 7.8%—less potent, but still entirely without CBD. Should Thai cannabis be seen as exceptional? Perhaps for this era in the UK it should, though both the quantity of samples available from seizures and ample anecdotal evidence suggest there was plenty of it about in the country, in addition to the stronger resins and concentrated oils. The LGC points out the unique appearance of the “Thai Stick” brand: “Green or brown sticks of several seedless tops tied around bamboo with a number of sticks compressed into a slab.” I’m sure there are readers who recognise this, either from having seen the real thing back in the day in the UK, or on their travels. To take a contrarian line, perhaps the changes that have occurred in the UK over the last two decades are about catching up to highs the market, and its consumers, had already reached in 1975. And all you have to do is travel and you will see that the old strains still available around the world are just as strong as the new strains available in wetern nations. The other funny thing about this is that Australia and the USA smoke this stuff too but Britain is the only one having a skunk freak out. Excellent info, very fair, and well set out. Anyone who’s read any of Dr O’Shaughnessy’s reports knows it was just as strong back in the day. Great article, I tweeted it to the BBC man himself. Not to mention the Nutritional Medicine cures for Schizophrenia and addiction. Yep the dangers of high potency cannabis ‘issue’ is a total red herring useful only for feeding the neo-reefer madness going around these days. I smoked great Thai weed back in the mid seventies, there were also great Columbian strains as well some very decent Red, Gold, and Rainbow. Thai eventually became stickless but the potency was still very high. Remember one particularly memorable batch which was called Buddha Stick. Quite dark with a few huge mottled seeds, large with an eighth or more on each stick. Remarkable stuff from around 1980.